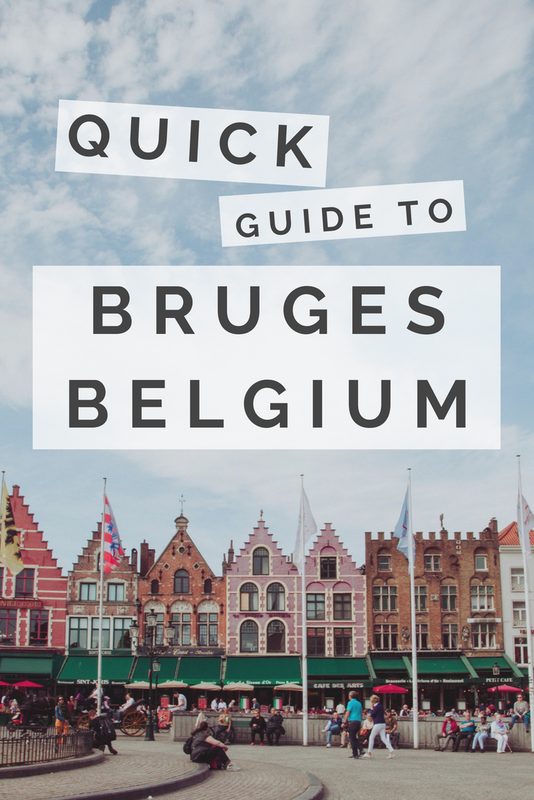 Ever heard of a little place called Bruges? If not, you need to be in the loop, and I'm going to help you get there! As some of you may know, Matt and I took a recent vacation to Europe and I've been spamming Instagram with my pics ever since! 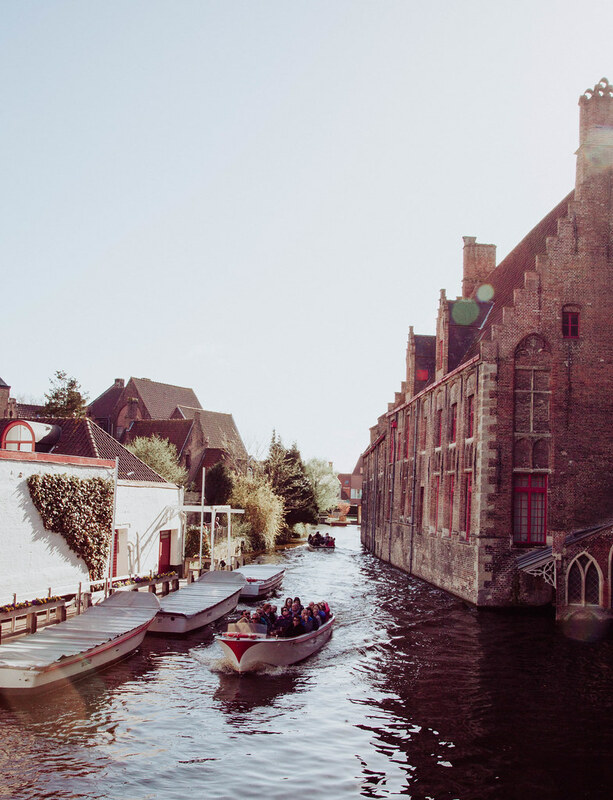 Bruges was one of the stops on our little Euro-tour, and I was absolutely charmed. Simply put, it's a town that is like a medieval fairy tale come to life. I remember seeing pictures of it on Pinterest and deciding it was a must-see on our Europe vacation. And let me tell you, it was not a disappointment! Everything we were looking for always seemed to be right around the corner. Walking around and bumping into great chocolate shops, beer gardens, and beautiful views was the easiest thing in the world. And speaking of beautiful views- you will get plenty of those here. The buildings look like those pretty little gingerbread houses... it's surreal! 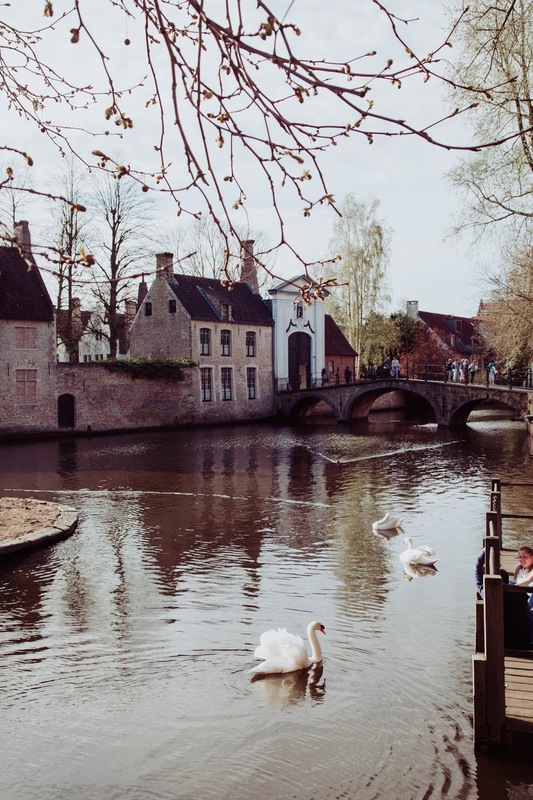 There are cobblestone streets, canals, and swans roaming about. Plus one of the main pastimes here are eating chocolate and drinking beer. Seriously, what more can you ask for? 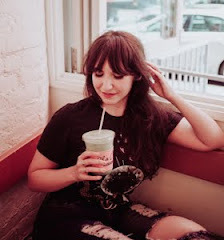 I put together a little list of my favorite things to do. It really was a pleasure to spend some time here, so I hope that I can help you figure out where to go and what to do during your stay! Located right in the center of town, it's hard not to bump into the main square. Every side of the square is lined with irresistible restaurants, bars, and shops. To be honest, food and drink directly in the square area are a little overpriced and touristy. Still, it's worth it to grab a beer or a meal! 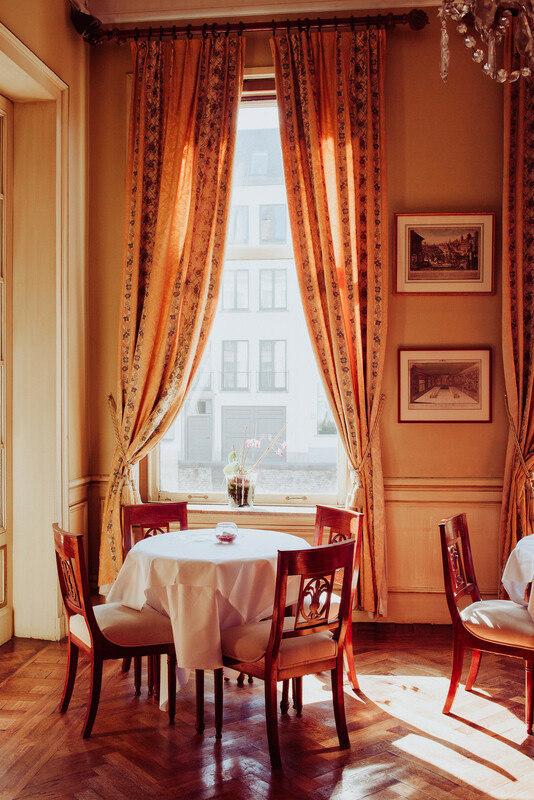 The vibe is relaxed, and the views of the gorgeous old-world buildings are priceless. There are many different restaurants to choose from, but I recommend finding one that serves traditional Flemish stew. So tasty and hearty, it'll keep you going the whole day long. If you've got room left over in your belly, you should also order the cheese croquettes... another local specialty that won't disappoint. Besides eating and drinking all the local delights, this is the classic, most famous Bruges activity. But it's not for the faint of heart... it's 336 steps to get to the top. If you can hack it, you'll be rewarded with insane views of the whole town. Trips are a half hour long, and not expensive at all. They're well worth your time as you'll cruise through the most charming parts of town. I can't overstate this enough... you MUST overindulge in these things when you get to Bruges! 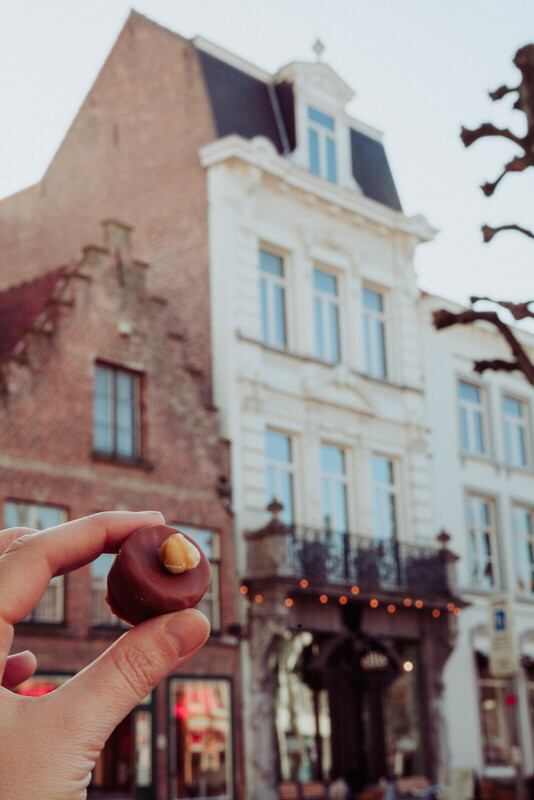 Chocolate shops are on nearly every block. Don't even try to plan which ones to go to. 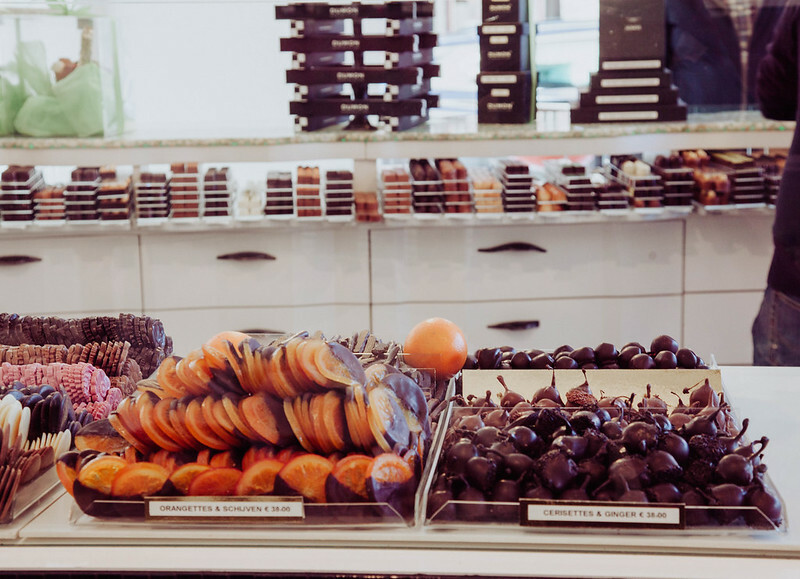 Just spend an afternoon chocolate-store hopping and sample from each. Beer bars are also plentiful and can be found nearly anywhere you turn. 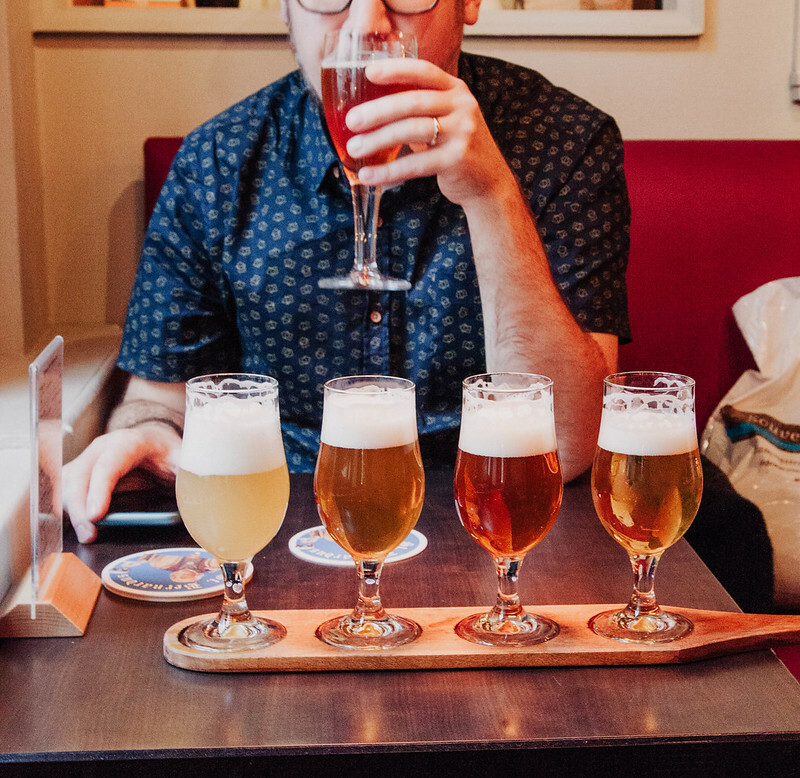 I'm not usually a beer drinker, but I found that in Bruges, beer was delicious and went down easy. 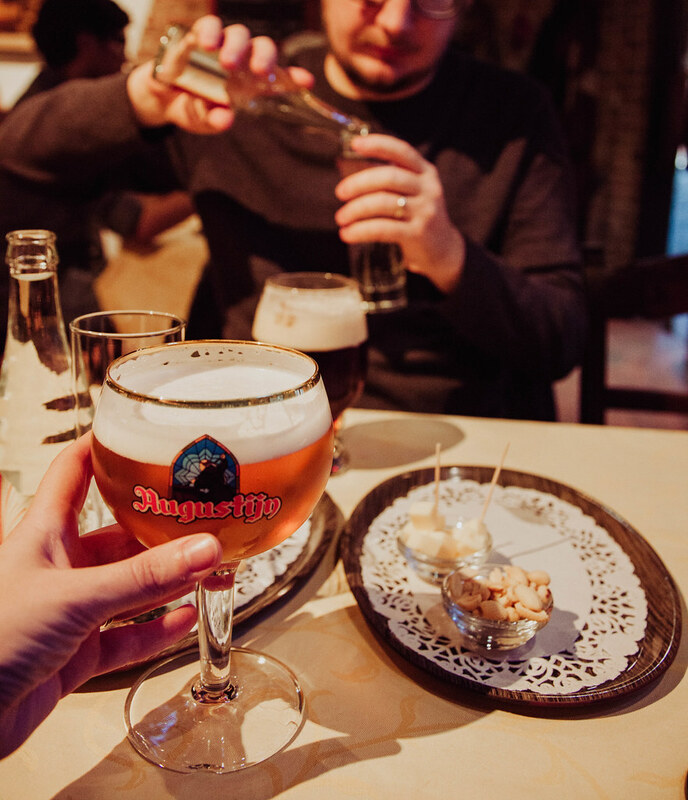 My one major regret on my visit to Bruges was that I indulged so much on beer, chocolate, and hearty Belgian food that I had no room for waffles! Ugh, can you even!!? Luckily on our way out of town, I grabbed a waffle at the train station, and even that train station waffle was better than any I've ever had. Still... don't make my mistake! Be sure to hit up a waffle stand as soon as you get there. Turning a corner and discovering this sweet little courtyard was one of the highlights of our day. 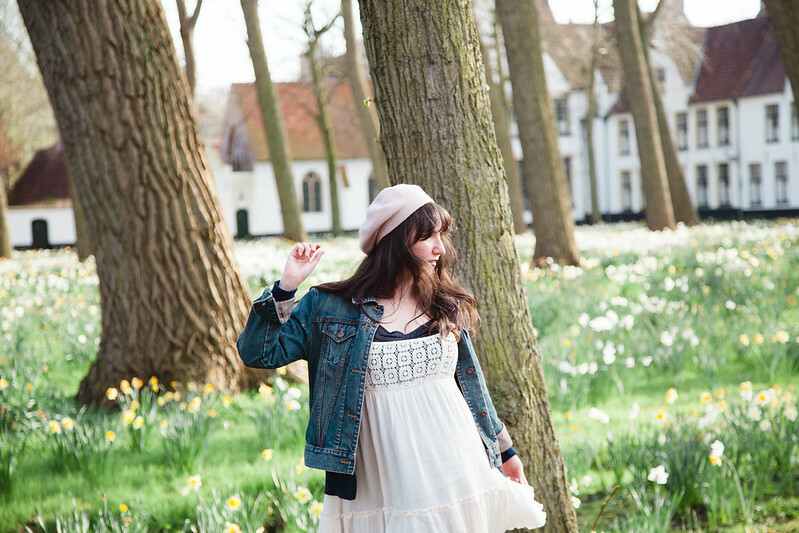 When you enter The Begijnhof the energy soothing, quiet, and you will immediately be calmed. Part of the reason is that even to this day, nuns of the Order of St. Benedict still live here. Be aware though- they like things to be kept quiet. If you can manage to keep it chill, it's a great place to sit, meditate, and avoid some of the crowds. Come in the spring to experience the glorious abundance of daffodils! Coming upon this spot was by far one of the most magical parts of the trip. We were exploring the city around sunset when all of a sudden we were by a part of the canals dotted with half a dozen elegant swans. The swans seemed to be aware that the tourists were watching and revel in the attention. A few were swimming around in circles gracefully spreading their wings, putting on a show for everyone! I can't remember ever seeing a swan in person, but they are surely one of this world's most beautiful creatures. 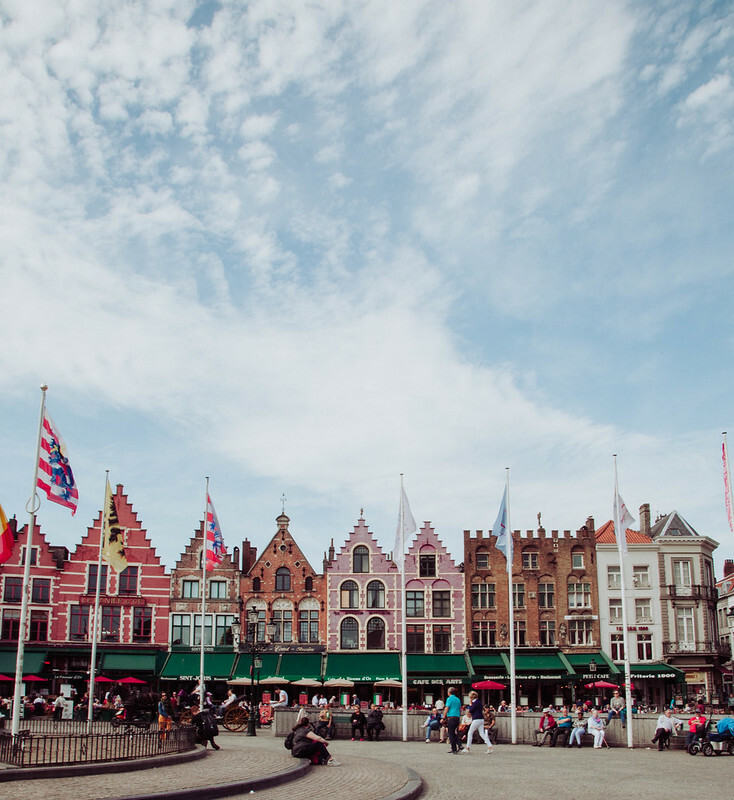 They are revered in Bruges and are interwoven in the history of the town. So you'll see them plentifully throughout. 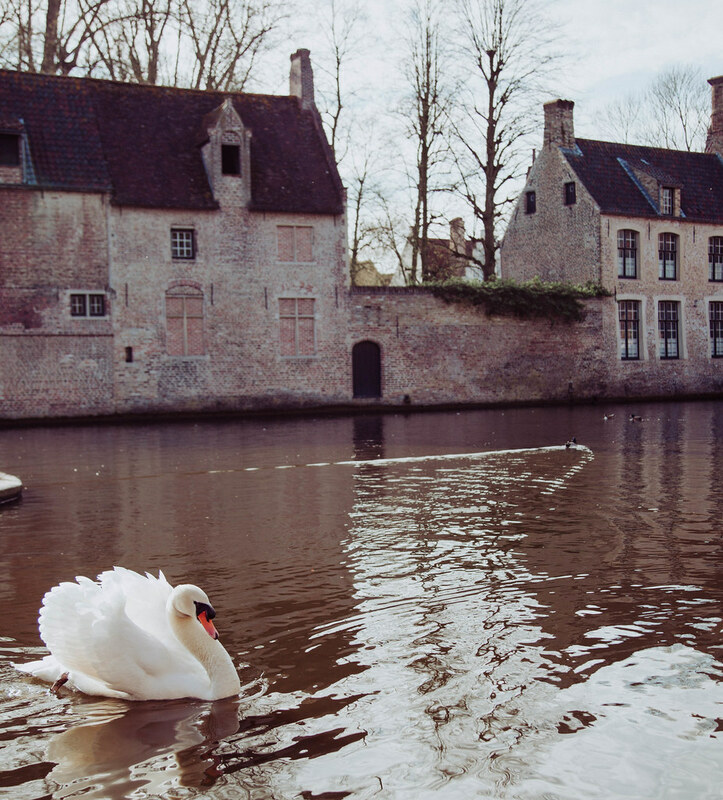 Maybe you'll think I'm crazy- but coming here was almost the entire reason I wanted to visit Bruges. I was searching through photos on Pinterest once and came across an article about this quaint little chocolate shop with a secret restaurant upstairs. The idea of it was so alluring, and I was excited when we decided to make it a part of our trip! 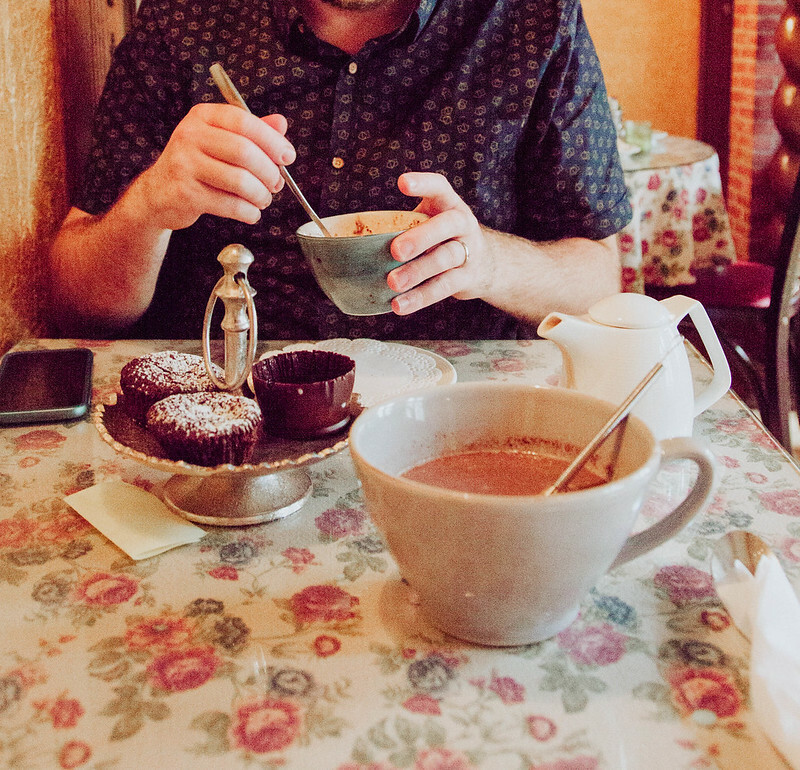 I still contend it's the best hot chocolate I've ever had, and am thinking about making a blog post solely about my experience here! This bar will make you feel like you've stumbled into another century. First of all, finding it is like going on a mysterious adventure. Your GPS will tell you that it's located directly in the middle of a building, which is obviously impossible. Finally, you'll locate the correct alleyway, only to walk right past the entrance! Haha, it's true, this place is a little hard to find... but that's half the fun of going. And once you get there, the old-world atmosphere, complimentary charcuterie, and massive selection of beer will more than make up for it. 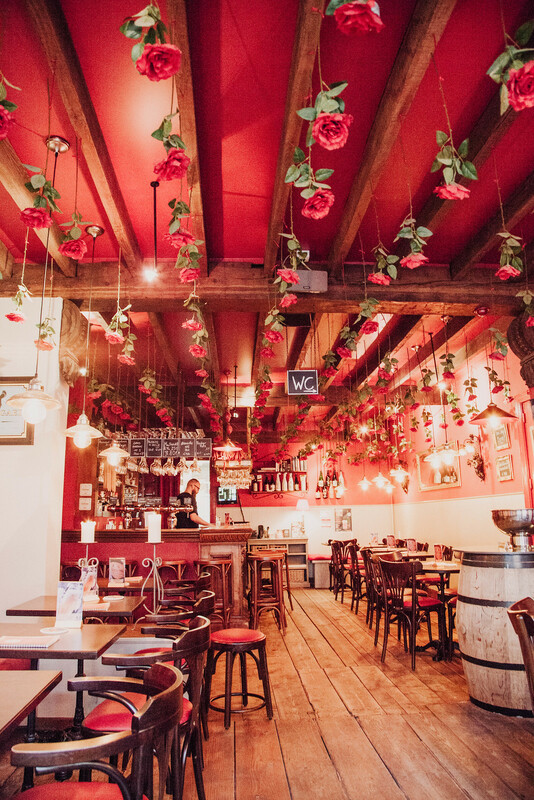 This was hands down my favorite bar in Bruges, if not the best bar I've ever been to (seriously!!) It's off the beaten path from the main square, but it's definitely worth the time to find it. To me, it was all about the atmosphere... which was more of a cafe vibe than a bar. Everything about being here made me feel at ease. There was the most gorgeous jazz music playing at the perfect volume. The bartender was friendly and knowledgeable and served us a delicious flight of beer. We sat for hours without a care in the world as a few other customers petered in and out. Wish I could come here every day. Yes, I drank all this beer. We looked into Airbnb's, but there weren't many available. 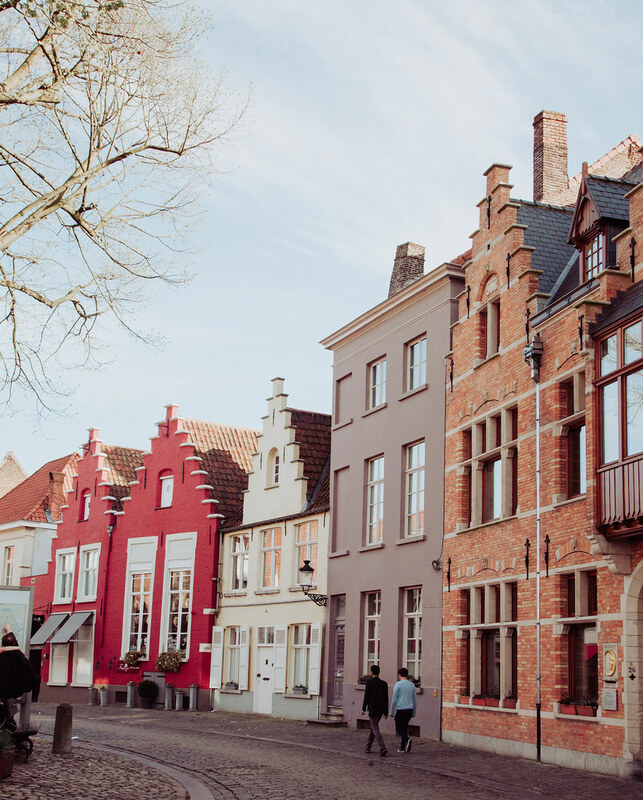 Because of zoning laws, there are a lot of restrictions on what you can and can't do with the buildings- that's one of the reasons why much of Bruges still looks gorgeously frozen in time. However, we found that the hotels in the area were more than reasonable. We stayed at Martins Relais, a hotel on the edge of town, but still easily walkable to everything you want to see. It was opulent, and beautiful... and around only $120 per night, which we thought was a great deal! 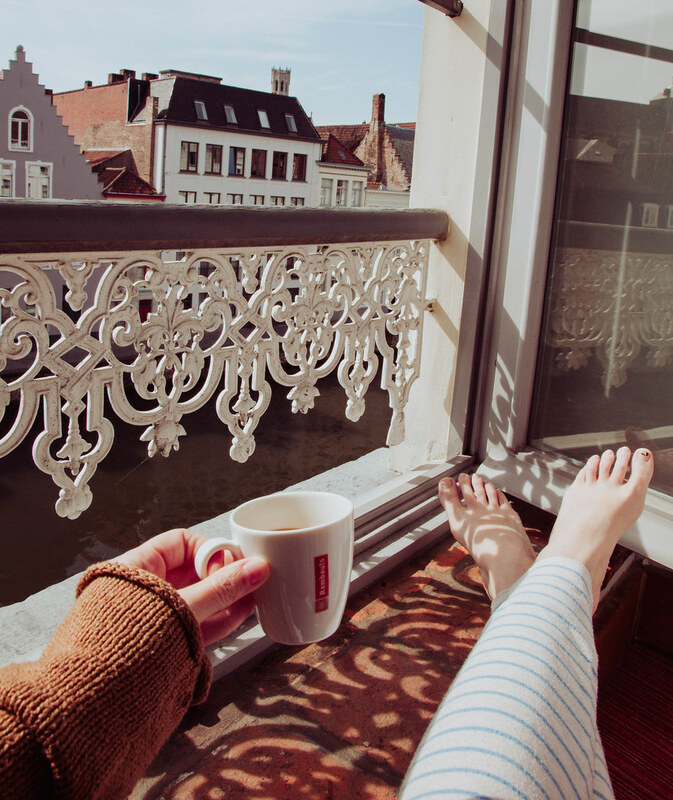 You can even get a room overlooking the canal, which we did and were very happy with.